Since starting in 1992, the present Burns company has produced various six-strings based on the Marvin, this maker's most sought after '60s original. These have included examples officially endorsed by Hank himself and fellow Shadow, Bruce Welch. The designation might be different, but the Dream is the latest in this line and, like others before it, combines Chinese manufacture with UK assembly. The Dream doesn't boast any obvious 50th birthday references, but marks the occasion via some new and upmarket features. These take this model to a higher price point than previous Marvin variants and, like each of its commemorative companions, only 50 examples will be available worldwide. Although derived from the Strat, the Marvin's outline is beefier, with offset lower bouts. The Dream adopts the same shape, complete with front and rear creature comfort contouring. The one- or two-piece basswood body is topped by a figured flame maple veneer, adding a luxury touch that sets this model apart from more traditional Marvin counterparts. The end result looks good under the review example's immaculately applied trans-burst red finish, although this is browner than the name suggests. The maple neck features a familiar C-shaped profile, along with equally predictable proportions, while easy playability is enhanced by the compound radius maple fingerboard and sleekly finished medium-slim frets. The Dream is the first Marvin derivation to increase the latter from 21 to 22, but the nut is still just a string spacer, as the traditional zero fret is retained. This somewhat anachronistic aspect evokes divided opinions among players, but Burns London boss Barry Gibson likes it, so it stays. Black position dots partner a 12th fret inlay that displays the Dream name, which is also on the headstock, neckplate and vibrato unit. Small black side dots are also present, but a little hard to see against the pearl binding of the fingerboard. The latter is birds-eye maple, while the neck is quite heavily flamed, with both finished in lightly tinted, high-gloss polyester. This somewhat unusual figuring mix has been chosen deliberately to enhance the Dream's distinctive appearance. The classic scroll-topped headstock employs an elegantly curving and quite gentle back angle. This eliminates the need for friction-inducing string-guides, while sideways deflection is less than on many three-a-side designs. Down at the other end, the neck is secured by four screws hidden under an appropriately engraved plate, along with access to the truss-rod gearbox adjuster, all in a hard-edged heel block. Hardware & Parts In typical Marvin manner, all three pickups are arranged in angled formation. These resemble regulation 'Rez-O-Matik' single-coils, but the Dream is the first Burns to feature the new ENR noiseless version. Developed by UK electronics whizz Alan Entwistle, this design combines a standard size and spec Rez-O-Matik with a smaller, specially wound hum-cancelling coil sited directly beneath. The circuitry springs no such surprises, comprising a five-way lever switch to provide the usual pickup permutations, plus a master volume and two tone pots. The second of these incorporates a push-pull switch to allow the additional all-three or neck-plus-bridge coil combinations. The three-section scratchplate dates back to the original Marvin and is made of thick, black laminated Traffolite, likewise the neckplate and spring cavity backplate. As on all the modern Marvin-style models, the Dream employs an accurate recreation of Burns' Rezo-Tube vibrato unit. Back in 1964, this bypassed Fender patents by reversing the under-slung springs, necessitating an extended baseplate. This assembly pivots in a knife-edge block and also accommodates individual string anchor tubes (hence 'Rezo-Tube') plus six adjustable bridge saddles. Twin bolts at the rear of the baseplate adjust overall tension, while the arm angle can be altered via a separate swivelling collar. Construction is mainly aluminium and all parts are gold-plated to match the Dream's other ironmongery. The design might seem somewhat over-engineered, but it has excellent return to pitch and a responsive feel that's ideal for delivering an effective shimmer. Extreme dive-bombing isn't recommended, but of course this instrument is intended for more restrained playing styles. Most components are unique to the brand and this made-to-measure approach extends even to minor parts such as the selector switch tip. Strap buttons are also usually brand specific, but the Dream employs a locking type very like the Schaller version, while the Burns-branded machineheads are also the locking variety and similarly generic. The abundance of on-board aluminium contributes to a warm-toned acoustic resonance and healthy sustain. These qualities undoubtedly affect the Dream's amplified performance, which has a sweeter, singing tonality compared to many six-strings equipped with more conventional metalwork. 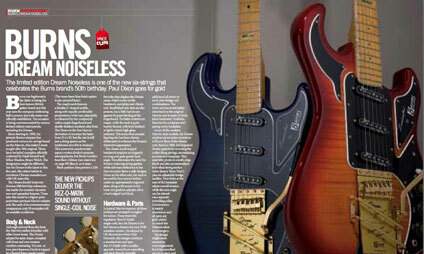 According to Burns, the new Entwistle-designed ENR pickups deliver the typical Rez-O-Matik sound without the usual single-coil noise problems, and plugging in confirms this claim. Comparison with a 40th Anniversary Marvin reveals that any aural variations between the two instruments are more about constructional differences than pickup design. The Dream is slightly lower in output, but Entwistle's new pickups really do capture the sonic character of the regular Rez-O-Matik single-coils. In all positions the expected tonality is present and correct, ranging from a deep and woody twang to an attacking bite, although the latter is alleviated by the airy open clarity that's an innate part of the Marvin's sound. Some extra top end snap is apparent, but this is probably due to the Dream's lacquered maple fretboard and basswood body. Playing in close proximity to a computer monitor can be a nightmare with conventional single-coils, but the Dream passed this aural acid test with flying colours, courtesy of an uncanny complete absence of any extraneous noises, unless held virtually up against the screen! This Burns responds well to a drop of dirt and the noiseless pickups come into their own as amp gain is increased, exerting more control than most standard single-coils, which means the Dream will go more raunchy and rocky than many players might imagine. Conclusion The Dream could be seen as simply another variation on the Marvin, and a more expensive one than most. But the upgrades involved are more than simply cosmetic and go a long way towards justifying the extra outlay for an already feature-packed piece of guitar making. The Rez-O-Matik ENR noiseless pickups make a pretty big difference performance-wise, living up to the hype and suffering no discernible sonic downside. They could therefore prove a genuine problem solver for any player plagued by intrusive interference. Of course, Burns' innate individuality will always be too much for some, but the Dream is an instrument that should appeal to any guitarist who appreciates high class combined with more character than most.